Set of parts. Score may be ordered separately. I have been Principal Clarinetist with the Charlotte Symphony Orchestra, North Carolina, since 1975. My interest in klezmer music began in 1984 when I realized how unique the clarinet voice can be in the klezmer idiom - it is totally different from playing in a symphony orchestra, and I found that unique voice to be very appealing. 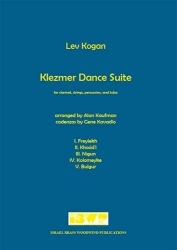 I formed a quartet called Viva Klezmer!, and we have been concertizing and recording ever since. 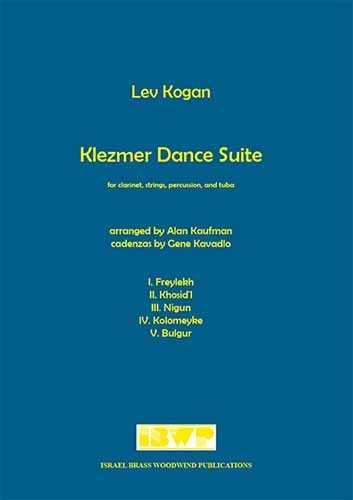 I discovered Lev Kogan's Hassidic Tunes for Clarinet and Piano a number of years ago and was struck by the lovely melodies and harmonies that Mr. Kogan had composed. The tunes were always enjoyed by audiences whenever I performed them, and it occured to me that several of them could be orchestrated and grouped together to form a very attractive klezmer suite. I enlisted the aid of my talented colleague, Alan Kaufman, and the result is this publication. There is dearth of klezmer music featuring clarinet with orchestra or chamber ensemble, and this publication helps fill that void. The suite can be performed with orchestra or, if percussion and tuba are unavailable, as chamber music with clarinet and strings. In the absence of tuba, the part may be played by another bass instrument. Lev Kogan (1927-2007) was born in Baku, Azerbaijan, and immigrated to Israel in 1972. Kogan attended the Moscow State Conservatory from 1946-1952 where he studied piano and was a composition of Aram Khatchturian. He has devotred much time to the research, creation and performance of Jewish music. In Israel, he has composed many productions for the Yiddish theater and Chassidic, Yiddish songs and chamber music. Originally from New York State, Alan Kaufman graduated from Potsdam State University with a Bachelor's Degree in Music Education and a Master's Degree in Music Performance in Percussion. Since then, he has been a performer, arranger, educator, producer and composer of commercial jingles, recordings and movie and television soundtracks. He has produced albums and/or has arranged for an array of groups from The Buddy Rich Band to performing with artists as diverse as Luciano Pavoratti and Bernadette Peters, to Dave Brubeck and Johnny Cash. Since 1978, Alan has resided in Charlotte, NC where he continues his musical journey. 10 original tunes in hassidic/klezmer style for clarinet and piano. OR-TAV Music Shop ©Copyright 2019 OR-TAV Music Publications - Powered by SunShop "Shopping Cart Software"